Isn't that great? Let's begin adding it! Step 1. Go to Blogger Dashboard > select your blog > go to 'Layout' & click the 'Add a Gadget' link. - to change the size of the avatar, replace 60 value in green. Step 4. After you've made the changes, click Save... and we're done! 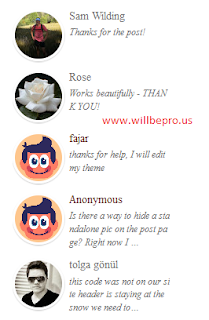 Once a reader sees the recent comments widget in the blog's sidebar, he comes to know that your blog is pretty active and that encourages him to post comments on your blog. This way, you can gather some active user base to comment on your blog posts.